The NBA’s third all-time leading scorer, Kobe Bryant, is retiring at the end of the 2015-16 NBA season. This should not be news to anyone, but what might be is that, he is the lone wolf still playing in the NBA from the illustrious and influential 1996 NBA Draft. With the older generation moving out, it’s time for the NBA’s young, up and coming stars to take over. Here are your NBA’s Top 10 players under the age of 25. Since entering the league in 2010 as the No. 1 overall pick, John Wall has always been an above-average point guard. Known for his acrobatic finishes, spectacular dunks, and flashy passes, Wall has averaged 17.6 ppg, and 8.7 apg in his six seasons. His one setback, though, that has been hanging over him is his ability to hit a consistent jumpshot. While it has improved every year since he’s been in the league, Wall is going to have to sure up that shot to solidify a spot as one of the game’s top point guards. With the NBA’s style of play changing, traditional, back-to-the-basket, post-up big men like Andre Drummond are hard to come by. Coming in as a 7-footer and weighing in at 279 pounds, Drummond is a nightmare for opposing big men. Averaging 17.8 ppg and 15.3 rpg, Drummond pulls down boards at a rate we haven’t seen in the league in a long time. He deservingly will most likely appear in his first All-Star game this February. Irving is one of the NBA’s most exciting point guards to watch. He can put points up in a hurry totaling in multiple 50-plus point performances during his career. Unfortunately injuries during key times has hurt Irving as well as the Cavaliers. Irving sat out the beginning of the 2015-16 NBA season from a knee injury he sustained in the NBA Finals against the Warriors. While he is back in action this year he is still getting a feel for back playing big minutes for the Cavs. Prior to George’s gruesome injury that occurred in the 2014 Team USA, Blue vs. White scrimmage, he was up in the ranks with Lebron James and Kevin Durant as one of the league’s best small forwards. His combination of speed, size, strength and leaping ability puts George in a category of his own. He has recovered incredibly and, in his first season back from injury, is putting up MVP-like numbers and is looking to start in the upcoming All-Star game. George is averaging 24.1 ppg, 7.6 rpg, and a PER at 20.92. Damian Lillard prides himself on being one the hardest-working guards in the league. He has a confidence about him that he brings to every game, which he developed growing up in the streets of Oakland, Calif. Lillard came into the NBA ready to play, playing the most minutes in the league his rookie campaign. 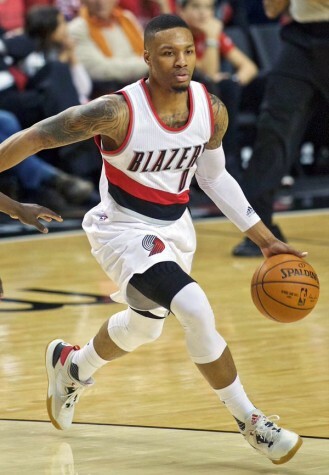 Just earlier this year, Lillard missed his first game of his career playing in 275 straight games. Lillard looks to make another All-Star appearance this year while averaging 24.7 ppg and 7.1 apg. One of the few true big men in the league, Cousins stands heads and shoulders above the rest of the NBA’s centers. He has amazing touch around the rim and the ability to step out and hit a mid-range shot and occasionally a 3-pointer. Cousins is the most skilled center in the league. The only thing that’s holding him back from being great is his attitude. He’s constantly receiving technical fouls and arguing with coaches and fellow teammates. Cousins needs to clean up his act if he wants to ramp his game up to the next level. Green was an undersized forward drafted in the 2012 second round by the Golden State Warriors. The pre-draft scouting reports about Green said that he had “low upside” and that he “isn’t quick or athletic … Too small to play power forward … Too slow to defend small forwards.” These words fueled Green into being one of the league’s best players. He brings an unmatched intensity to each game. He can guard any position on the court. He has drastically improved his shot, proving night in and night out to be a legitimate threat from the 3-point line. Green, with his newly developed shot coupled with his ability to drive to the basket, poses a huge mismatch for the opposing team’s big men. That alongside with his lockdown defense secures Green with the start in the upcoming All-Star game. The NBA’s Defensive Player of the Year award winner, just nudging out Green for the win, Leonard prides his game on shutting down the opponent’s best player. Leonard’s hand size is an astonishing 9.8 inches, and he has a 7-foot-3 wingspan. This allows him to accept each challenge that is thrown at him. Whether it’s Lebron James, Kevin Durant, Klay Thompson, he does not back down. The second member of the “Splash Brothers” along with Stephen Curry, Thompson has one of the NBA’s sweetest and quickest strokes. Thompson being drafted 11th overall by the Warriors in 2011 was great for his career: he fit perfectly into their style of play allowing him to showcase his full arsenal of scoring moves, whether it’s 3-pointers or mid-range pullups or fadeaways. Klay can get hot and put up points on the board faster than almost anyone in the league. This was put on display when he went 13-for-13 in the third quarter alone against the Sacramento Kings last January, totaling 37 points in the quarter, the most amount of points in a quarter in NBA history. Thompson is one of the best shooting guards in the league not only because of his offensive skills but because of his ability to be a lockdown defender and guard the opponent’s best guard. Former No. 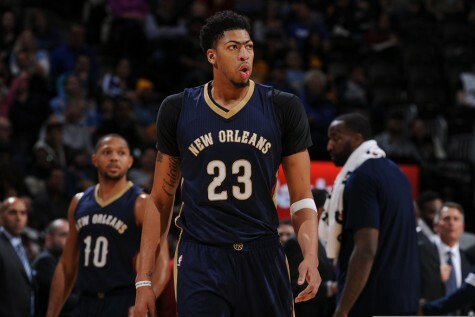 1 pick, Anthony Davis, averages 23.4 points, and 10.1 rebounds per game. professional. This former No. 1 pick is one of the few players who plays on both sides of the ball at an all-league level. Coming in at 6-foot-10, Davis can score in a variety of ways, from dunks, to pull-ups, to mid-range, this hybrid forward is unlike any player the NBA has ever seen. Not only can he score but he can flat out play defense. Averaging almost 11 rebounds a game and just less than three blocks, Davis is a rim protector. He will block your shot, rebound it, and take it coast to coast for a dunk as he’s done many of times in his short career. At the start of last season, a poll of GMs on NBA.com said that the majority would build a franchise around Davis, even over LeBron James and Stephen Curry.